It gives us immense pleasure to cordially invite you to the workshop on "Ultrasound (USG) guided nerve blocks ". In this workshop there will be lectures on role of ultrasound in nerve blocks along with live scanning demo followed by hands on training sessions. Ultrasound Guided Nerve Blocks are becoming increasingly popular for perioperative Regional Anaesthesia because of the low failure rates and less amount of the local anaesthetic agents required, thus increasing the safety of the patient. It is the time that all anaesthesiologists should be familiar with different types of blocks using ultrasound. 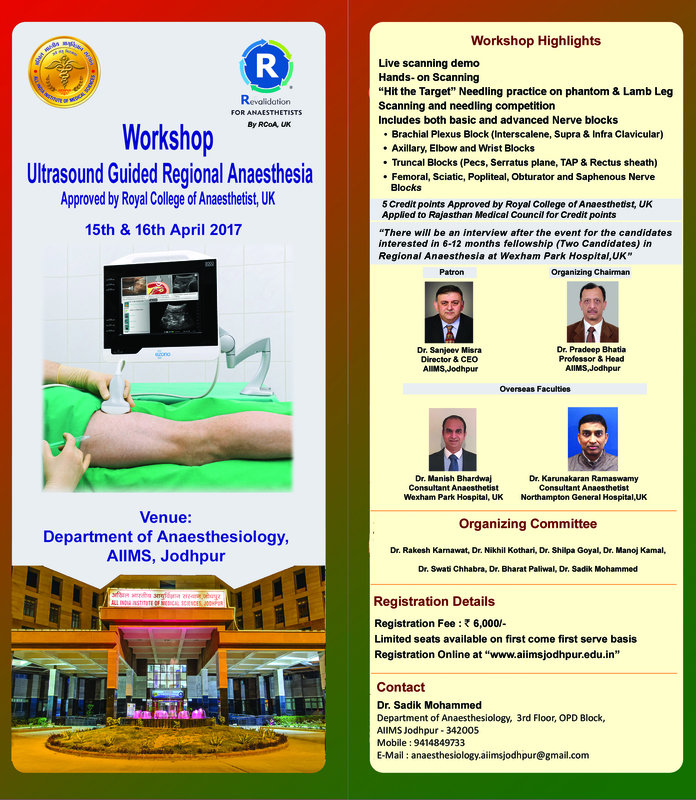 The Department of Anaesthesia, AIIMS, Jodhpur has taken a lead in this direction, as we are organizing "Ultrasound Guided Regional Anaesthesia Workshop" in collaboration with faculties from UK. This is an opportunity particularly for the young budding anaesthesiologists to learn, interact, discuss the subject with the experts and to do "Hands-On"practice on Lamb Leg and Phantom. A event is approved for 5 Credit points by Royal College of Anaesthetists,UK. Credit points by Rajasthan Medical Council is awaited. On the second day there will be an interview after the event for candidates interested in 6-12 months fellowship (two Candidates) in regional Anaesthesia at Wexham Park Hospital,UK. The seats are limited on first come first serve basis. Prior registration is mandatory as there will not be any "Spot Registration "